In her book A Century of Service, Pamela Hallan-Gibson reveals that it wasn’t until California became a state in 1850 that law enforcement institutions became established. Back then, Southern California was a lawless society, overrun by rustlers, highwaymen and murderers who blatantly defied the law. Times have definitely changed. When Orange County was formed in 1889, its citizens finally acquired a sheriff, and today the Dana Point Police Services is on a mission to provide responsive, professional and caring law enforcement for all, while promising to aggressively apprehend criminal offenders. 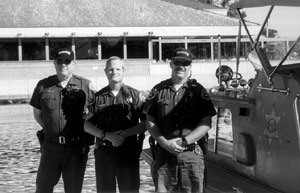 Law enforcement is not the only concern of the Dana Point Harbor Patrol. Eighty percent of all calls the department receives will be for disabled boats, hazardous material spills and medical aid. (Incidentally, there is no charge to those who need help for non-emergency situations.) A red fire boat is docked at the ready and the sheriff’s department works closely with the fire department and also the paramedics. Not much goes on in this sleepy harbor tucked away in the southern most portion of Orange County. No headless bodies have ever been found floating near the boats on foggy mornings. Vacationers are here to have a good time, not to create problems for law enforcement whose deputies do their utmost to complement tourists’ holidays, providing services such as boat safety and outreach for children. In the midst of this serenity, however, there are many interesting stories to be told. “I remember,” 31 year veteran officer Walt Stephenson recalls, “when the ‘Wild Times’ vessel was returning from Catalina. The Captain had the boat on autopilot when he tripped over some fishing tackle and fell overboard. Fortunately for him a ‘Grand Banks’ trawler heard his cry for help and rescued him. Meanwhile, on board down below on the ‘Wild Times’, his wife and son, unconcerned, knew nothing about the accident. The boat continued on its way travelling at 12 knots per hour toward the harbor.” Stephenson paused. “By the time we were called out, ‘Wild Times’ was 1.5 miles from the jetty. Our sirens were blaring, lights flashing as we rushed to the scene and still the two passengers didn’t emerge from the cabin. When the boat was approximately l mile from the harbor the commotion finally caught their attention and we yelled at them to turn off the autopilot. No go. The Captain’s wife and son had no knowledge. Not only does this dedicated branch of law enforcement assist the public; they are also expected to do so in a friendly and effective manner. And, according to Sheriff-Coroner Michael S. Carona, the Department, “combines time-proven methods with emerging technologies to confront the unknown threats to our communities and continue to persevere and provide future generations with an unsurpassed level of safety”. So, next time you experience the ‘black and white’ fever after being pulled over by a Sheriff, remember, the ticket you receive will be handed to you in a friendly, but obviously, effective manner! This is good to know.